WTI crude prices have collapsed below $45.50/b this morning. WTI opened at $45.85/b today, a major drop of $2.13, or 4.44%, below yesterday’s opening price. 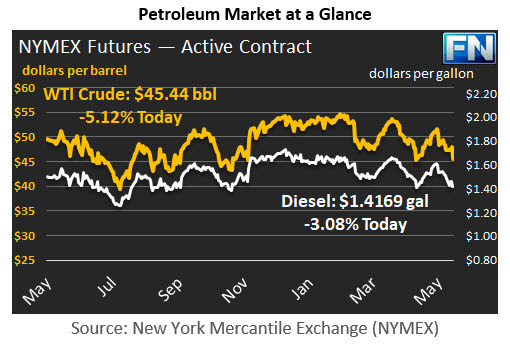 Current prices are $45.44/b, a further decline of $0.28 below yesterday’s closing price. This is the lowest price in over a month. Diesel opened at $1.4268/gallon this morning. This was a decline of 3.41 cents, or 2.33%, below yesterday’s opening price. Current prices are $1.4169/gallon, up slightly by 0.07 cents from yesterday’s closing price. Gasoline opened at $1.5023/gallon today, down 2.65 cents, or 1.73%, from yesterday’s opening. Prices are $1.498/gallon currently, a recovery of 0.67 cents above yesterday’s close. Prices dropped sharply yesterday when the Energy Information Administration (EIA) released the official U.S. weekly supply data. The industry had been expecting another drawdown in crude stockpiles, as much as 4.6 mmbbls according the American Petroleum Institute (API.) In a serious reversal, the EIA instead reported a stock build of 3.295 mmbbls. Until this past week, crude stocks had been drawn down for eight weeks in a row, consistent with the ramping up of refineries, the seasonal increase in gasoline demand, and the supposed trend toward a better supply-demand balance. The unexpected addition to inventories came as a shock to the market. The EIA also reported a diesel stock build of 4.355 mmbbls, plus a gasoline stock build of 3.324 mmbbls. Last week, the EIA reported a gasoline stock draw of 2.9 mmbbls, which was the largest drawdown in a four-week streak of gasoline inventory draws. As we noted yesterday, if the EIA data corroborated the API’s forecast of a gasoline stock build, it may signal weak post-Memorial Day demand. The weekly supply data reported that apparent gasoline demand rose by 118 kbpd during the week leading up to Memorial Day (the week ended May 26th,) but it plummeted by 505 kbpd during the week after (the week ended June 2nd.) Naturally, one week of data does not define a long-term trend, but the unexpected additions to stockpiles set off market selling. Because the across-the-board stock build has had such a major impact on prices, we are providing a special focus on weekly stock movements as a second article today. For the week ended June 2nd, crude stockpiles stand at 513.2 mmbbls, 11.4 mmbbls higher than last year’s level. Gasoline stockpiles are 240.3 mmbbls, 0.7 mmbbls above last year’s level. Diesel stockpiles are 151.1 mmbbls, 0.3 mmbbls below last year’s level.